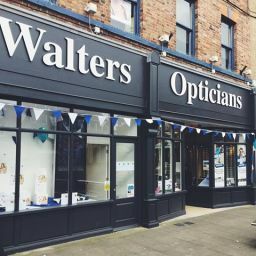 Walters opticians - eye tests - contact lenses - Eye care for the whole family Walters Opticians aim to always put the patient first and offer the sort of personal and high quality service that is rarely experienced these days.We offer a comprehensive eye test, backed up by an extensive range of ophthalmic equipment. In addition, we have an ophthalmic laboratory to make spectacles on the premises. •1 hour glazing service - rimless, full rim and half rim Reglaze facility using the latest Essilor Mr Blue digital lens edging machine.